I am meeting more and more people who are as excited about biotensegrity as I am. People who are thrilled to discover that there is an alternative to the mechanistic view of the body as a machine. People who have heard Dr. Stephen M. Levin’s theory that the body is a structural tensegrity, and immediately recognize similarities between tensegrity structures and the living body. People who feel the strength, flexibility and stability of a tensegrity plus it’s ability to spring back to a neutral resting place. Yogis who feel how the entire structure responds to movement as an integrated whole and realize the same in their bodies. Qi gong practitioners who notice how tapping on one of the tensioned strings of a tensegrity sends vibrations throughout the entire structure, and recall shimmering vibration of energy flow within. Dancers who see the chirality in a tensegrity and relate these to the arcs and spirals that arise naturally in movement. Many of these people are movement teachers and they want to know more about biotensegrity. They want to begin a deep dive into learning. Are you one of these people? If you are, I bet that you have come across the same challenges that I have. My passion and enthusiasm is strong but I cycle through understanding and confusion. Biotensegrity is a complexity science and a new paradigm. I can’t tell you how many times I have thought that I understood one or other aspect of the science, only to realize I how little I know. I have stumbled as I tried to share biotensegrity with my students. I have wondered how I can share tensegrity without props and have carted tensegrity sculptures and various teaching aides across town on buses, and across the ocean on planes. Again and again I have heard myself use mechanistic language when referring to the body and movement. I feel as though I am a slow learner. 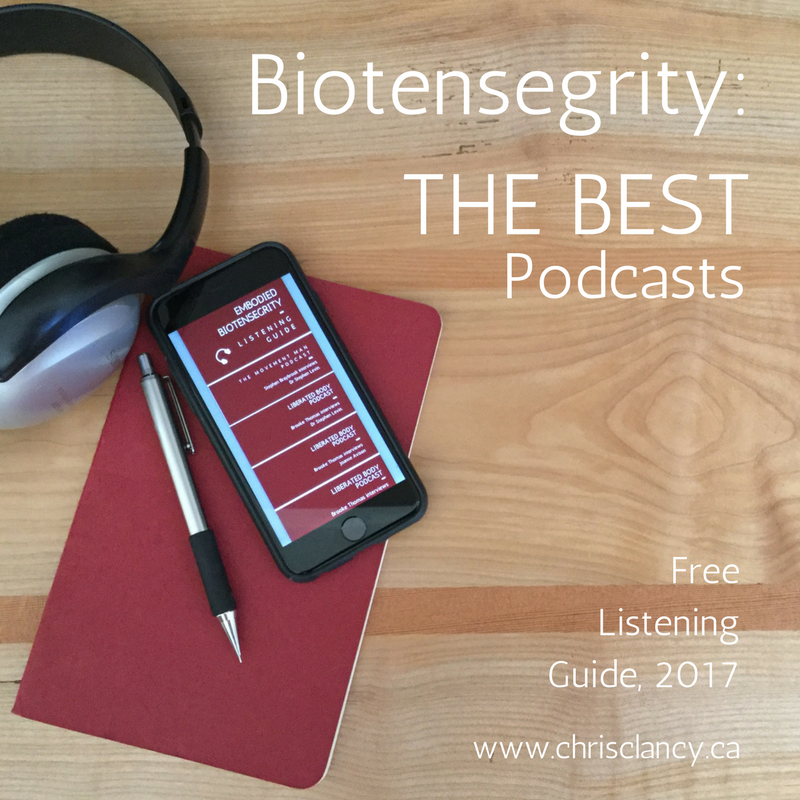 I wonder about how best to bring biotensegrity to those that want to learn and to introduce it to those who haven’t even heard the word. My passion always carries me through. In these past two years since I met one of my mentors – author, and executive administrator of the Biotensegrity Archive, Susan Lowell de Solózano – it feels as though the universe is putting me in a place to help bridge the gap between the biotensegrity experts and the people on the streets through yoga teachers and others interested in the moving body. I began bringing biotensegrity to yoga teachers in Embodied Biotensegrity Trainings in spring of 2015. I am excited (and terrified) to announce that this fall marks the launch of Embodied Biotensegrity Online Learning. This has been a long time coming and is a process in evolution. “Better ninety-nine false moves than only one right one”. Join Susan Lowell de Solózano and me the first ever Embodied Biotensegrity Online Course. 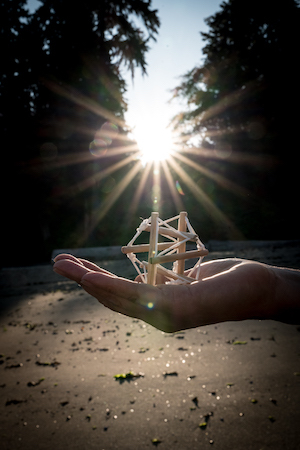 The beta launch of Biotensegrity Basics: Making a Tensegrity for Your Classroom is now open for registration. This is limited one time only opportunity with only a few participants and a special price. I will be using your feedback to refine the course so that it best suites your needs. Please check out the free content and let me know how you like it, register for the whole course and join the live webinar on Saturday September 23rd. PS. Here’s the link for the online course. You will receive a free listening guide and a pdf with instructions to build your own collapsible tensegrity when you join the free trial.